The SAA Career Center, from 11 AM-1 PM on Saturday. I will be offering career advice and hugs. This entry was posted on August 17, 2011 at 10:30 am and is filed under swag, text. You can follow any responses to this entry through the RSS 2.0 feed. You can leave a response, or trackback from your own site. 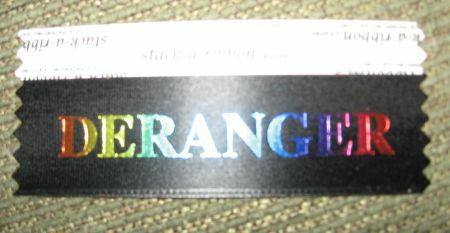 I totally want a Deranger ribbon! I work at NARA – and I’d love to hang it on my shiny cubicle wall. Can I send you a SASE? I will be looking you up! I still have mine from last year. It was awesome to meet you today! Thanks for the ribbon. :) I always knew that you’d be a kindred spirit if I ever ran in to you somewhere. Thanks for keeping archives hip!